Holy hell, people. After what feels like a normal drama’s entire summer break, we’re inching our way forward to the return of The Walking Dead for the second half of Season 5. And following an aesthetically interesting, but footage-free promo hitting last week, we now have our first good look at what’s to come for our band of hard-knocking survivors. Check it out. Don’t you love the way they make these trailers exciting by giving us zombie kills and loads of guns, but barely anything that actually feeds into this constantly on-the-run storyline? Me either. But there are still quite a few things seen here that get the mind wandering and wondering where Rick is leading this crew. For one, while there are a lot of woods and rural settings—which is what we’ve come to expect from 75% of this series—we do get to see Tyreese and Noah standing in front of some houses in what looks like it might be a neighborhood. (And comic readers know that neighborhoods are a major part of where this series is probably headed down the literal road.) Plus, when Rick pulls his sword out in one cha-ching motion, it looks like he’s standing in front of either a run down diner or maybe even a bumper car arena. Daryl is in some kind of a barn or a storage area, and Maggie gets a look into someone’s living room, where one of the more legitimately spooky zombies is just laying on the floor and being horrifying amidst the can goods and blankets. Eww. Glenn looks like he’s in a lot of trouble, scared as hell as he brandishes his weapon in the darkness. There’s also one part where it seems as if Glenn, Maggie, and more are trying to keep a door barricaded with their bodies. The first rule of zombie apocalypse should be “only go into buildings that have their own door barricades handy.” The second rule? Keep your arrows locked and loaded. Now that the group is free from cannibals and psycho hospital cops, they’re free to go wherever they want. But we have no idea what they want at this point. Washington D.C. seems like it’s out of the question now that Eugene’s secret is out, and sticking around Atlanta again is a dumb idea. Maybe they can head to Los Angeles to meet up with the spinoff crew. We know that Ross Marquand has joined the show in a mystery role, so maybe he’ll be a tour guide bringing everyone to safety. But probably not. 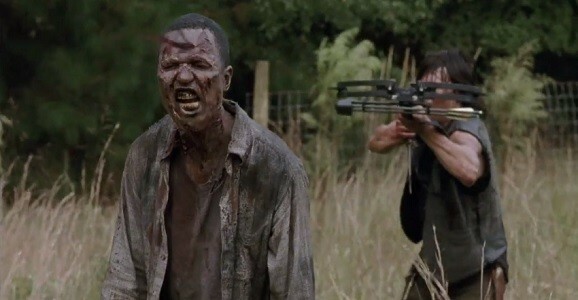 The Walking Dead returns to AMC on Sunday, February 8.